We do not believe in the best, but the FITTEST. With extensive in-house staffing and talent management experience across industries, we don’t believe in the best employees or candidates, but the fittest ones. Successful staffing is not about hiring the best people to work for your organization. Instead, as we often hear from the HR old saying – “putting the right person in the right place at the right time at the right cost”, we believe successful staffing should be just that and this is also what Flex Recruitment strives to achieve for its clients. From our observation, most of the hiring cases that fail are not due to the incompetence of the new hire i.e. not because he/she is not the best technically, but mainly due to the mismatch between the new hire and the organization, either culturally or motivationally. Expectation gaps emerge between the two parties after starting the employment, which could be a direct result of an inadequacy of expectation management and lack of “chemistry” assessment by the recruiter during the selection process. 1) Technical Fit – We make sure our recommended candidates are equipped with the right knowledge, abilities, skills and experience (KASE) towards the roles our clients are looking for. 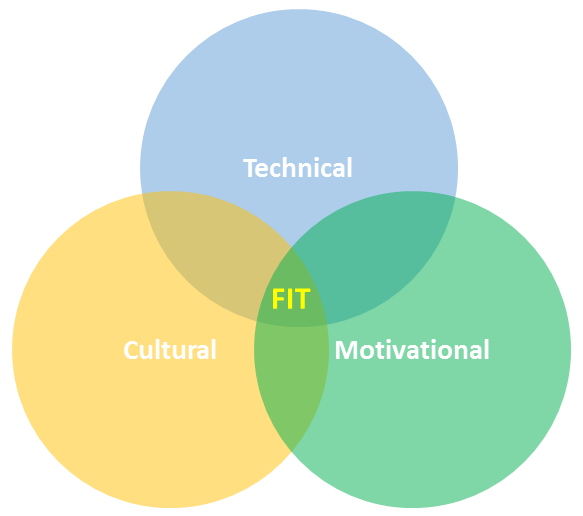 2) Cultural Fit – We make sure our recommended candidates have the right personalities and characters that can fit into the teams of our clients. 3) Motivational Fit – We make sure our recommended candidates are genuinely interested in our clients’ jobs and have the right attitudes towards the clients’ requirements. We seek to understand your needs and help you define your hiring directions. Through our database and networks, we search and identify the right talents for you. Once the talents are identified, we convince and solicit them to join your team.